Just What is a Charism? A charism is always deeply connected with our faith and is an expression of our relationship with God. In this way it differs from a natural or learned ability. A charism must be exercised in the context of the Christian’s overall discipleship in submission to Jesus Christ and His Church. 1. An unmistakable inner experience of peace, energy and joy when you are using the gift. It energizes you! When exercising your charism there is a natural flow and ease about the whole experience, a sense that we “fit” that we have found our place, that we can be most truly ourselves and, at the same time, an agent of a Goodness that far exceeds our natural abilities. 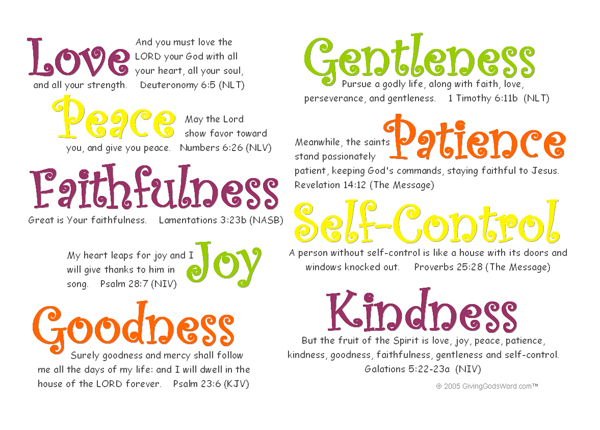 What is the difference between the seven “gifts of the Holy Spirit” found in Isaiah 11, (wisdom, understanding, counsel, fortitude, knowledge, piety, fear of the Lord), the “fruits of the Holy Spirit” listed in Galatians 5 (love, joy, peace, patience, kindness, goodness, faithfulness, gentleness, and self-control), and the spiritual gifts (Charisms)? The Catechism of the Catholic Church says, “There are gifts of the Holy Spirit that we are given to keep and gifts we are given to give away. The traditional “seven gifts of the Holy Spirit” and the “fruits” of the Spirit are gifts given to us to keep. They are part of our inner transformation as Christians and provide the inner “Christ-likeness” necessary for the effective use of our Charisms (CCC1830-1832). The Fruits of the Spirit give evidence of the working of the Spirit in our lives.